The First National Bank building in downtown Lexington will be transformed to the city’s own 21c Museum Hotel. A group of heavy hitters from Louisville recently made a scene in downtown Lexington. It wasn’t a basketball team coming for a tussle, though, it was the founders of 21c Museum Hotel — and they came bearing art. Steve Wilson and Laura Lee Brown announced plans for a new 21c Museum Hotel in Lexington at a meeting with local officials, and they were accompanied by a familiar sight for 21c fans: the penguin. But this time, it was not 21c’s famous Red Penguin, as originally created by Cracking Art Group, but one ever so slightly better adapted to its future habitat. This time, the penguin was blue. 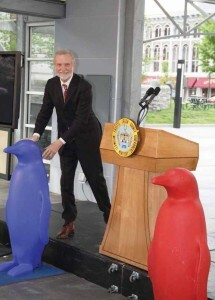 The press conference to announce 21c Lexington included the unveiling of a new blue – penguin that is. That meeting confirmed rumors, breathless whispers and blatant hopes that 21c would in fact bestow upon Lexington its acclaimed brand of artsy hospitality. Properties in Cincinnati, and Bentonville, Ark., still are in development (expected in 2012 and 2013, respectively), but the original location in Louisville has been recognized by Travel + Leisure as one of the world’s best hotels (2010, 2011, 2012). 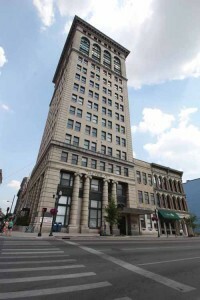 Plans recently submitted for review to the Courthouse Area Design Review Board for the Lexington property, the historic First National Bank Building, include potential for a similarly recognized experience in Central Kentucky. The hotel will offer a unique dining experience. One feature of the proposed layout is a glass wall facing the street that will provide a view directly into the kitchen, and a venue for the performance art of gourmet food preparation. There are expected to be approximately 80 guest rooms, one of which will be a penthouse suite spanning two floors with a rooftop terrace. 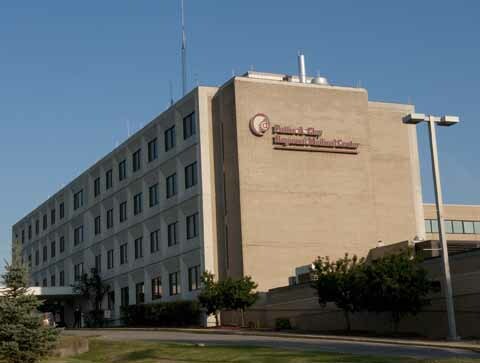 While details such as financing and a final close on the property are pending, there is broad local support, and indications are that the plans will move forward to an opening date for 2014. 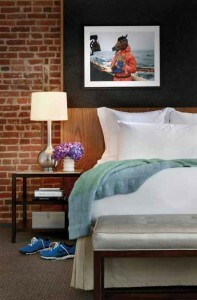 Guest rooms at 21c all feature unique art and an urban feel that jibes with the founders’ mission of downtown preservation. Lexington’s thriving and growing downtown will swell just a bit more when the project is complete, but in the meantime, its movement toward art, community and downtown life is what drew in 21c Museum Hotel from the outset. “Wheel of Fortune” by Anne Peabody is a site-specific installation at 21c in Louisville that is physical record inspired by the artist’s memory of the tornado that leveled much of the city on April 3, 1974. 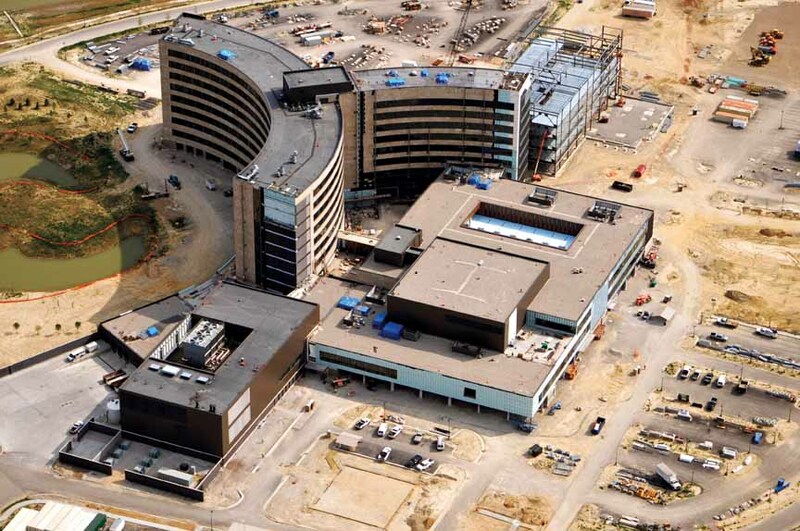 21c will take Central Kentucky by storm when it opens in 2014 in downtown Lexington. All the talk of plans for 21c Museum Hotel’s Lexington location have you curious about the 21c experience? You don’t have to wait until 2014 to take it all in. 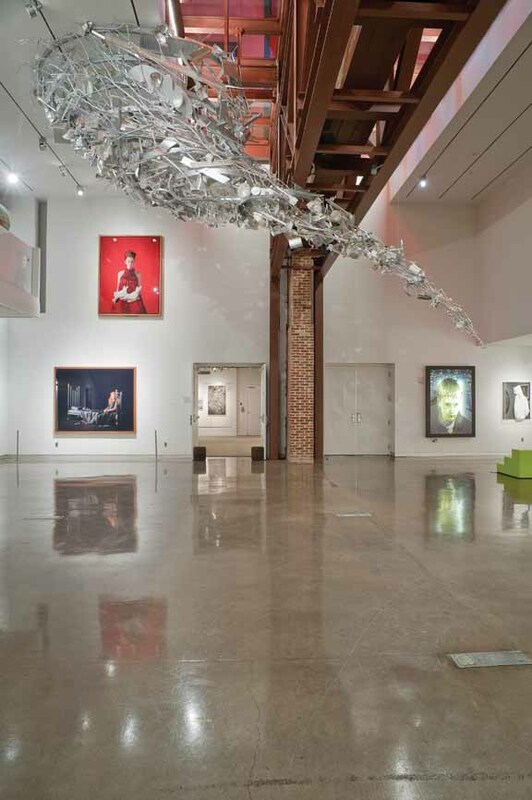 With the original location in Louisville so nearby, a quick trip may be in order for a weekend getaway, gourmet dinner at the hotel’s restaurant, Proof, or a tour of the new exhibitions. And you can engage entirely on your own schedule. Stop by at your leisure. Exhibitions are open seven days a week, 24 hours a day, every day of the year, free of charge. Or check out the website for updated information on events such as gallery hops. Cox said one of her favorite parts of 21c are the artists lectures that frequently are offered. One of 21c’s unique aspects is the art everywhere concept. 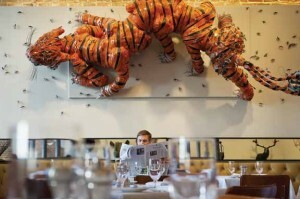 In the main dining room of Proof, art installations surround patrons, even above their heads. A new exhibit just installed at the 21c Museum Hotel lobby gallery in Louisville is called “Blue: Matter, Mood and Melancholy” and features works by artists from around the globe. The multi media exhibition features meditations on the color blue, its meaning, interpretation and feeling. In the atrium galleries, new pieces were added to “Convergence: Highlights from the Collection 2012,” which features photography, video, paintings and sculptures that comment on our lives and work in a changing global community. For the more playful art admirers, check out the larger-than-life, 30-foot golden replica of Michelangelo’s David that was installed just prior to Derby. He’s taken up Louisville residency along with several Red Penguins outside 21c following a trans-oceanic trip from Turkey, where workers constructed him, along with another statue, at the behest of artist Serkan Ozkaya. The twin David remains in Istanbul. Dishes and drinks at Proof are artfully conceived, not to mention delicious – and reasonably priced. 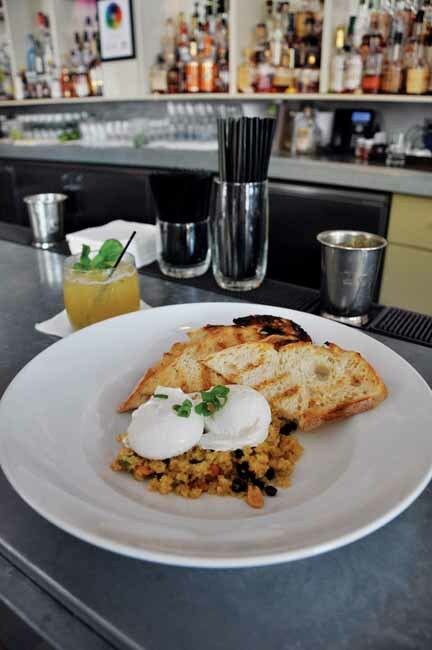 The curried quinoa features a delightful blend of flavors and textures and is complemented with poached eggs and sourdough toast. 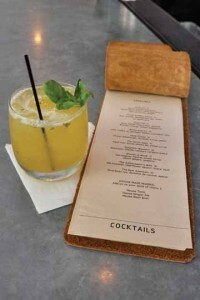 The property’s restaurant, Proof, has become a destination itself and is worth a trip just to try one of the fresh and innovative dishes (try the Bison Burger or Curried Quinoa), or a signature cocktail, many of which have been dreamed up by bartenders and include tasty garnishes. Proof also celebrates Kentucky’s signature spirit, Bourbon, with style and creativity. As with the rest of the property, Proof features art installations that surround diners, enveloping the space in a brash but comfortable atmosphere of art. Even a leering boyish statue of Pan isn’t too intimidating, offering a forbidden fruit (rub it for good luck) as he perches on the end of the bar. The Ambassador’s Wife is one of several drinks mixed up especially for Proof by one of its enterprising mixologists. Cox does acknowledge there’s something to booking a stay at the hotel. Various room types, from basic to over-the-top, are available, though even the basic room is a study in contemporary aesthetics with exposed brick and photography or paintings on the wall that far exceed typical hotel art. 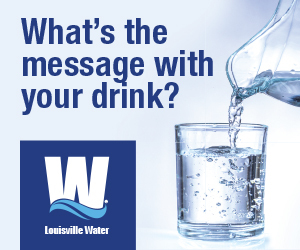 For more information, pricing, packages and a calendar of events and exhibitions, visit 21cmuseumhotels.com/louisville.